I might be sick this week but that won’t keep me from having Fun with Maps! Map 43 was posted to my Facebook wall by my brother-in-law, Dave. Dave and his wife, Val, are big supporters of my blog. They read my posts regularly and send me maps they hope I haven’t seen before. Sometimes I have seen them before (I’ve seen a lot of maps) but the map below is one of those that I had not. It shows the best and worst places to grow up by county. The map below is not interactive so if you want to check out how your county compares, follow the link to the New York Times (but definitely come back here). You can also change the data set to include different income levels and just boys or girls. I live in Hennepin County, a large county consisting of Minneapolis and about two dozen suburbs. According to the interactive site, a poor child growing up in Hennepin County would make 3% more than the average child by age 26. Hennepin County is a pale yellow dot surrounded by pale and dark blue in the map (shown larger below). Carver County, to the West of Hennepin, provides a poor child 21% more in earnings than the average. A few Western counties reach 26%. Overall, Minnesota is doing pretty well! Much of Iowa, Utah, Wyoming, and the Plains States are also above average. The South and Southwest are largely below average. Hopefully I have done enough to inspire you to check out the original interactive version, the next map will be ready when you get back. Oh good, you came back. Map 44 shows planned road construction projects in Yellowstone National Park. I came across this map while planning our September road trip. We’ve both been to the National Park before and know that traveling within the park can take quite some time because the speed limits are low, traffic can be horrid, and there are thousands of things to pull over and see. Obviously, an over-planner like myself wanted to know if there were any road construction projects occurring during our stay. There are two known as of now, and luckily neither necessitates total road closure (in September). We can expect delays of up to 30 minutes but if everything goes according to their schedule we won’t have to drive fifty miles in the opposite direction to cross the park. Visitors to Yellowstone traveling before June 11th at 7:00am and staying in Grant Village would have to take a very long detour to see Old Faithful and some of the best thermal features in that area. I imagine campground bookings in Grant Village and West Thumb will be below average in May and early June. My family visited Yellowstone when I was 16 and the road between Tower Junction and Canyon Village was closed. 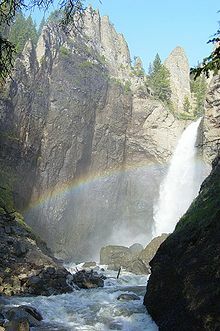 That meant we didn’t get to see Tower Falls, something I hope to finally get to see this fall. There’s a ton of cool stuff to see in Yellowstone and ideally we’ll get to see as much as possible. My family spent three days there and it was hardly enough. Even listening to the same three CDs on repeat I couldn’t get enough. As a teenager it could have been easy to get bored but not me. I was more than happy to listen to music and gaze out my window as we drove. I don’t remember my sister being as patient but she couldn’t help it, she was only 12. Beth’s family stopped at Yellowstone almost every year on their way out to visit extended family in California. They stopped to see Old Faithful every time they were there. It sounds like she’s fairly excited to re-visit Yellowstone so hopefully she doesn’t mind me stopping to see all the touristy stuff along the way. She wants to bring our dog along for the trip so if we stop to see something she doesn’t find interesting she can just walk her around. I’m a little nervous about taking Maeby on a road trip. The Bombens brought their dog along on all their trips but they had three kids to take care of her. I’m worried Maeby won’t let us leave her alone in the car long enough to grab food or visit certain attractions. She’s very high energy and doesn’t respond well to being separated from us. I’ve told Beth to start training her to be happy while alone in the car. Here’s hoping that works! Thanks for reading this Fun with Maps post. If you like what you see please follow my blog to be made aware of future posts. Actually, even if you don’t like what you see, subscribe!